The head of the National Capital Commisssion said she expects Ottawa-Gatineau's version of a bike-sharing program to be a success, despite the recent financial troubles of the company behind the program. 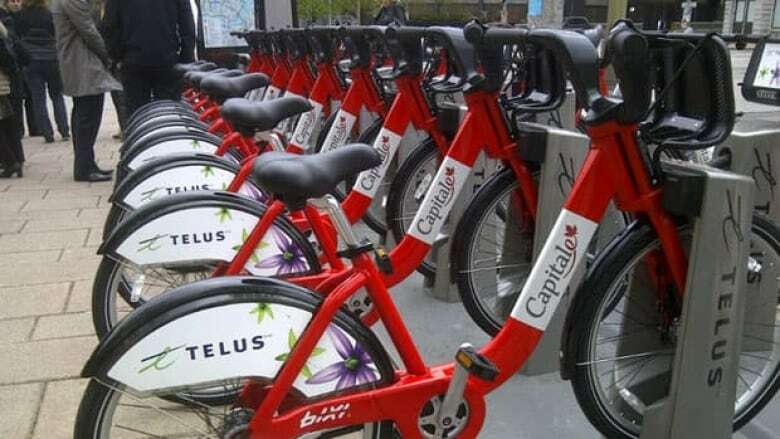 The head of the National Capital Commission said she expects Ottawa-Gatineau's version of a bike-sharing program to be a success, despite the recent financial troubles of the company behind the program. The Capital Bixi bike-sharing program, run by Montreal’s Public Bike System Company, launched on Wednesday with 10 stations with a total of 100 bicycles serving downtown Ottawa and Gatineau. NCC Chief executive Marie Lemay said it was a proud day for the capital region, which joins the ranks of cities like Paris, Rome, Washington and London in having its own bike-sharing program. On Tuesday, the City of Montreal approved a $108-million bailout package for the Bixi bike-sharing program. The package includes $37-million to cover Bixi's deficit, and another $71-million in loan guarantees to export and develop the system abroad. Lemay brushed off concerns about the financial viability of the program, which is running in the capital region without support from the cities of Ottawa and Gatineau. Public Bike System Company president Alain Ayotte also assured Bixi riders here shouldn't worry about registering for an annual pass. "We are in line with the financial plan, and we are very confident that we will continue to be highly profitable," said Ayotte. The bike rentals have a base cost of $5 for a 24 hour rental period, $12 for 72 hours, $28 for 30 days or $78 for a year, plus additional fees for trips longer than 30 minutes from one bike station to another. The bike rental costs an additional $1.50 for the next half hour, an addtional $3 for the next half hour and $6 for every half hour after that. Lemay said she is also encouraging employers to join the program and add more stations. She said Public Works and Government Services Canada has announced it will add a station in Gatineau and the NCC is talking to Environment Canada about adding the program's 12th station. Lemay said the cost to a business of putting a bike rental station in a parking lot would likely be about $20,000 over a three-year contract.